It’s important to clean your wedding gown right after your wedding. With over 35 years experience, you can trust Plainview Cleaners to gently clean your precious wedding gown. Your wedding gown is individually, hand inspected. We take precautions to protect or remove delicate buttons, ornaments, and trims so that they are not damaged in the cleaning process. Each intricate detail is finished by hand. Plainview uses very gentle odorless cleaning solutions that are especially effective on beads, sequins, lace, trims, and vintage fabrics. We have had excellent results through the years with very few exceptions. All gowns are hand-spotted, cleaned, and hand pressed. The veil and headpiece are hand spotted and cleaned if needed. To protect and preserve the gown for future weddings, we hand pack it with acid-free tissue paper in a specially designed acid-free keepsake box. If you wish, you may view your gown before packing. 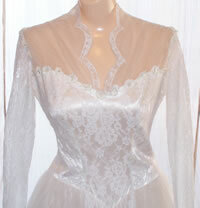 If you live in our delivery area, we are happy to deliver your gown to you at no charge. Plainview Cleaners can also help you prepare for your upcoming wedding by “spot cleaning” your gown for areas that may have become soiled due to fittings and other wear. We can also press/steam your gown and veil to remove any wrinkles before your big day! If you are planning a Destination Wedding, we have the prefect box to transport your special gown. 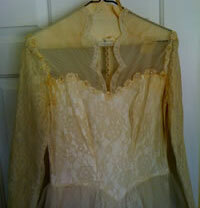 We also preserve Christening and Baptism Gowns. Once the ceremony is over, you’ll want to make sure the garment is stored and preserved safely for future generations. After cleaning, we hand-pack the gown with acid-free tissue paper in a specially designed acid-free keepsake Christening box. Restoring garments to their original state is part of our mission to make you look good. Plainview Cleaners also sells Treasure and Accessory Keepsake Boxes. Our popular, easy-to-store Keepsake Boxes are acid free, archival preservation boxes. They are versatile for almost any size treasure. Perfect for First Communion accessories, head pieces, tiaras, veils, bouquets, wedding shoes, baby shoes/booties, baby keepsakes/toys, designer purses, prom accessories, costumes, photos, announcements, dvd’s and more. The Keepsake Boxes come in two sizes. Ask for a keepsake box the next time you are in the store.